Fr. Luke Hoyt was born in Berkeley, CA, where he was raised in the Dominican parish of St. Mary Magdalene until his family moved to eastern Ohio. He is the second of five children. He received a Bachelors of Music from the University of Michigan, where he studied piano performance. As a seminarian for the Diocese of Steubenville, he received a Bachelors of Philosophy from the Pontifical College Josephinum. 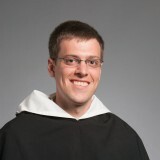 He is grateful to be a Dominican friar who can devote his life to the ministry of the Word.